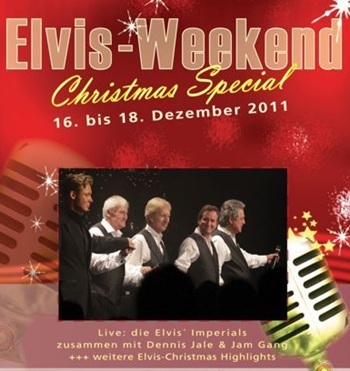 Organised by Markus Henfling, last weekend was the special Elvis Christmas celebration in Bavaria, Germany. 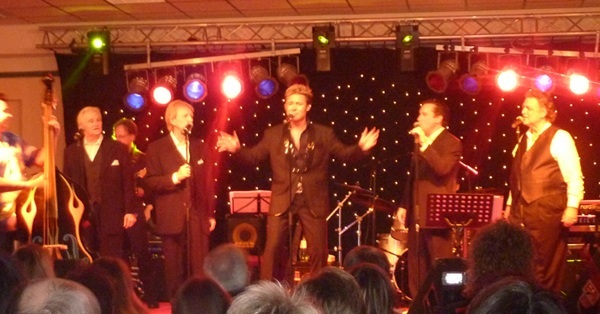 In attendance was Elvis' Imperials along with performers Oliver Steinhoff and Dennis Jale and his band Jam Gang. Hotel Kaiserhalm is located in the small community of Bischofsgrün, in the south of Germany, not far from the Czech border. The area is popular for its ski resorts. Some of the roads have a rather steep incline of about 12%, so no wonder that a lot of trucks were having difficulties navigating these roads, especially now with freezing temperatures. 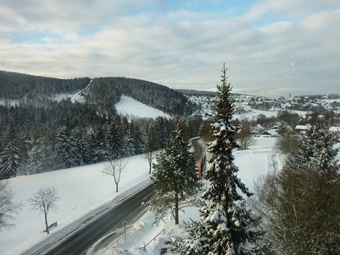 As we arrived at the hotel, the kids were pleased to see that the area was covered in snow. The hotel reception looked stunning with elaborate Christmas decorations. I think we all felt a buzz of excitement just looking at these decorations. Elvis had always had a special connection with Christmas, so it felt appropriate that an Elvis weekend would take place here. We were greeted warmly by Markus Henfling, the organizer of this event. Markus was immaculately dressed as always, and I was impressed with the fact that he made the effort to try and welcome each person individually. He told me that the event was sold out, and that 160 fans would be attending. Tired after 7 hours of driving, we went up to our hotel room to unpack. The view from our room was quite simply breath taking. Following an elaborate dinner, Markus informed us that The Imperials were delayed due to weather conditions. He decided that it was best to have them perform on the second night, and not on the first as originally planned. German ETA Oliver Steinhoff would be performing tonight. It was good to see a lot of familiar faces, like Helmut Radermacher, editor of the excellent ‘Golden Boy Elvis’ magazine. I also spotted German actor Uwe Rohde, who was wearing a TCB chain. He later told me that he had received the chain from a dear friend -- Oliver Steinhoff. I won’t try to hide the fact that I was initially a bit disappointed that we were going to see Oliver instead of The Imperials that night, and the first part of his show did very little to change that viewpoint. Oliver Steinhoff is an attractive guy with a strong voice, and it was easy to see why especially the female part of the audience loved him. He has a boyish charm and a nice sense of humor, which saved him during his recreation of the ’68 comeback, which at times felt a bit awkward. Oliver bravely tried to recreate the sit-down show, just him and a backing tape… no guitar, no buddies together on stage with him. He put a lot of effort in it and I guess he made it work, more or less, but I felt a growing sense of restlessness. I wasn’t all that comfortable watching an ETA to begin with, and Oliver’s somewhat clumsy recreations hadn’t impressed me all that much so far. But then, just as I thought about calling it a night, he made a complete turnaround with the show. Oliver got up, and announced that he was going to do a couple of songs from his favorite Elvis sessions, the Memphis ’69 recordings. And right from the get-go he really got into the groove of this material, sounding far more confident and convincing than he had up to that point. His singing was surprisingly good on songs like ‘Power Of My Love’, ‘True Love Travels On A Gravel Road’, ‘You’ll Think Of Me’ and ‘Wearin’ That Loved On Look’. 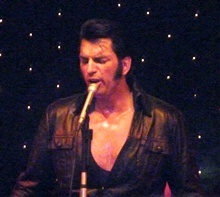 Oliver was particularly impressive on ‘Long Black Limousine’, which he sang with power and intensity. The standing ovation that he got at the end of the show was well deserved. Both my wife and I liked him. Those who know me will attest to the fact that I’m not into the whole ETA thing at all, but we were both pleasantly surprised by this guy’s voice and stage presence -- especially following his less than promising start. Around noon the following day, my old buddy Real (Ray) Bouwman arrived from Holland. I’d told him about the weekend the night before, and he decided to come and visit us together with his girlfriend Deidre. 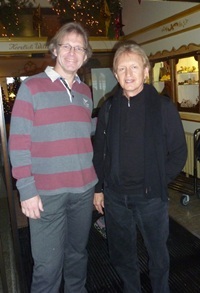 Real and I met up with Helmut Radermacher, and discussed all the latest news and releases in the Elvis world. Helmut was not too pleased as he thought MRS had taken some liberties with their latest Hayride release. We decided to attend the Q&A session with Joe Moscheo and Terry Blackwood. Joe seemed a bit grumpy initially. Could be the jetlag, could be boredom… These guys have been answering the same old questions for years, so I can’t really blame him. At one point he told the crowd that he wanted to show them his (colorful) socks, since they were far more interesting than this whole Q&A session!! I could certainly sympathize with these guys… what on earth are you going to say about someone with whom you’ve worked with on and off for about 3 years, about 40 years ago? The questions were indeed hardly groundbreaking, and my kids were getting restless, so we decided to go out and have fun in the snow. And I’m glad we did. 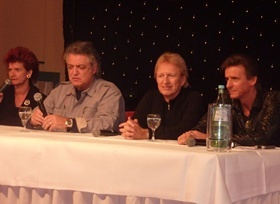 Later that evening, Dennis Jale and his band Jam Gang did a show together with The Imperials. I’d seen the Imperials about 10 years ago in Odense, Denmark and they had been excellent then, but there had been some changes in the line-up since that show. Therefore it was good to see (& hear) that they were still just as good, and perhaps even a notch better. Their harmonies were excellent, particularly on ‘Sweet Sweet Spirit’ (a real showstopper) and ‘He Touched Me’. 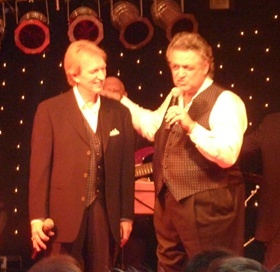 I gained new admiration for Terry Blackwood, a tremendous singer and showman, and someone who really knows how to connect with a crowd. He sang the gospels with great warmth and sincerity, and yet kept things light with his jokes between songs. Joe Moscheo on the other hand still seemed a bit grumpy at first, but he loosened up considerably as the show went along. Joe’s deep voice and his bigger-than-life personality were almost as entertaining as Terry. At one point Terry referred to Joe as the "Italian Stallion", which drew a lot of laughter, and they both joked about Terry being just a small blonde kid when ‘That’s The Way It Is’ was filmed. Not having seen Dennis Jale from Austria before, I didn’t really know what to expect. Dennis is a neat-looking fellow, very ‘showbizz’ and with a light but generally pleasant voice. It’s always hard for any singer to get compared to Elvis, and I have to admit that at times I really wanted Dennis’ voice to be a bit stronger, but c’est la vie… There’s only one Elvis. On the plus side it has to be said that Dennis is a topnotch entertainer who knows all the showbusiness tricks on how to work a crowd, and he has a tremendous band behind him. These guys were seriously good, and I particularly enjoyed guitarist Goran Mikulec and slapbass player Manfred Chromy. However, it has to be said that their showbiz antics were a little too much at times; Sometimes Goran would be running to the front of the stage to serve up a series of hot ‘metal’ licks, and then Manfred would do the same, throwing himself on the floor to really slap that bass. Sure, it was all good fun and the crowd really lapped it up, but sometimes The Imperials did look a bit lost amidst all these theatrics. As for Dennis, his best moments came with ‘I Believe’ and ‘Stand By Me’, where vocally he reminded me a bit of Ronnie McDowell. He sang both songs with great warmth. During the show’s finale, ‘Suspicious Minds’, Joe Moscheo really made my daughter’s day by pulling her on stage. Initially she looked a bit petrified but then seemed to enjoy the whole experience, and she stayed there for much of the song. As for my son, he’d fallen asleep in the middle of the show. You can’t win ‘em all, I guess. The following morning, as we said our goodbyes to The Imperials, Joe once again singled out my daughter Sheila, telling her how beautiful she was with the blonde hair. "I’m a real Italian", he said, as he pointed at his own hair. Then he shook my hand and said: "Hey, I made your daughter a star last night!". Suddenly it struck me that he reminded me a bit of Tony Soprano of the ‘Sopranos’ television series. He winked at me and went on his way. Quite a character. The time had now come for us to say our goodbyes to organizer Markus Henfling, who proudly told us that this weekend had raised over 800 Euros for needy children. He said that Elvis had always been a generous man, and had supported a lot of charities, especially those involving children, and Markus wanted to continue that tradition in Elvis’ honor. A tremendous achievement, and a great note to end this very special weekend on. All photos by Arjan Deelen unless credited otherwise.